Off Incline Village’s Tahoe Boulevard, tucked into a small building near Wildflower Café, is Handmade At The Lake. Tables brim with art prints, jewelry and pottery, but the eye is drawn to the colorful quilts lining the walls. Some pieces depict mountain scenes. Others show flowery gardens. Still others are studies in color, the valuation changing throughout the composition. These intricate works, mostly comprised of two-inch squares of fabric, are the creation of Incline’s Karen Colbert, an artist who took a circuitous journey to get where she is today. As a child, Colbert and her family moved often due to her father’s job in the Navy, living on both the East and West coasts, as well as spending three years in Japan. Colbert attended Heald College in California, then worked for the engineer and construction firm Bechtel in San Francisco and received her associate’s degree from Diablo Valley College in Pleasant Hill, California. About 30 years ago, she moved to Incline Village and not long after met her future husband on a blind date at Incline’s Hacienda restaurant. A little more than a year later, they were married. Colbert continued her education, earning a degree in Business Administration from Sierra Nevada College. As part of her humanities degree, she was required to take a color and design class. She’d taken up quilting as a hobby when she was pregnant with her daughter, Jill, who was born in 1991, but it remained a hobby until May of 1999, when she hung a few of her quilts at a local hair salon. That month, she sold $500 worth of work. Although quilts are her business, Colbert doesn’t define herself as a quilter. 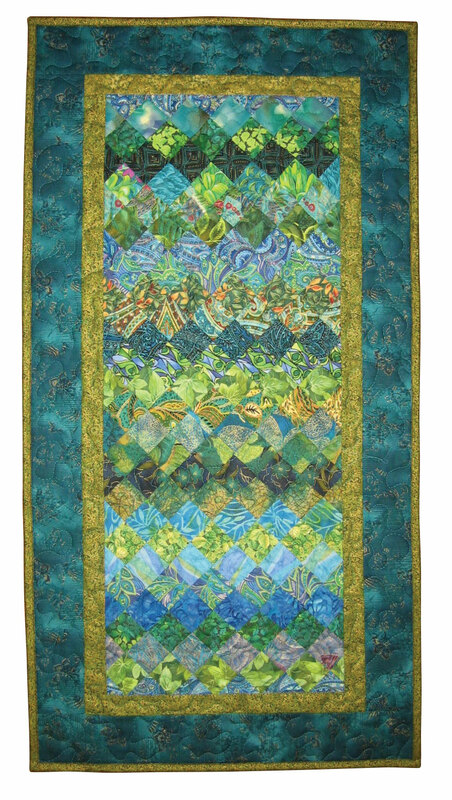 Her specialty is in the creative work, allowing color to come together in creative combinations within her unique and elaborate quilts. “By using rich, colorful fabrics, I let the fabrics dictate the design instead of following a pattern that anyone could replicate,” she says. Colbert keeps her fabrics, which differ between her landscape quilts and her abstracts, organized in about a dozen pizza boxes. The fabrics are further separated by the size of the squares—either two inches or three-and-three-eighth inches—and by color value. 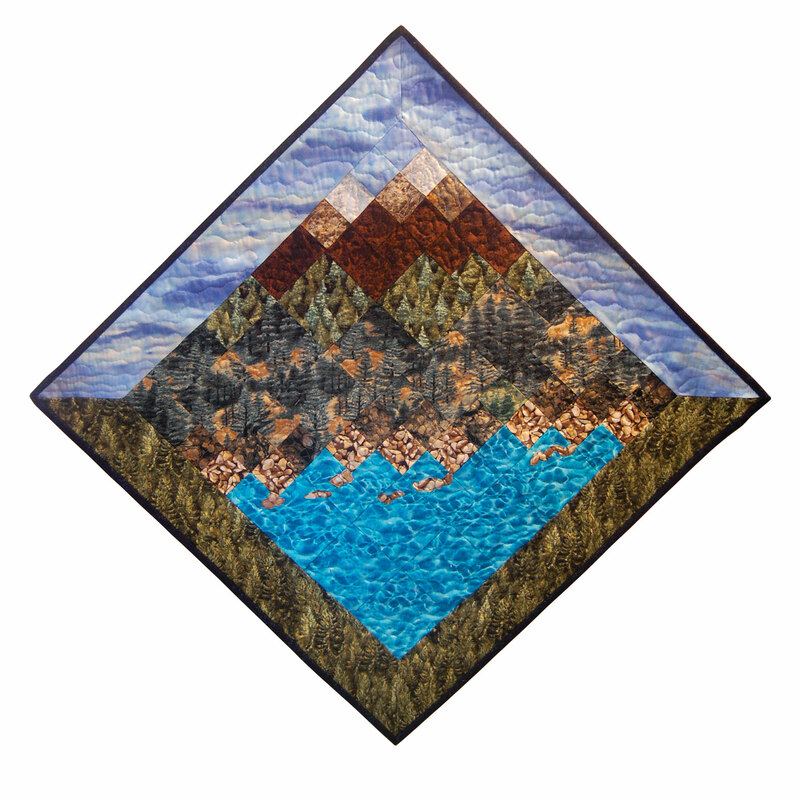 While she began by sticking strictly to color themes, she fell in love with designing landscape quilts after reading several books depicting mountain and lake themes. “This seemed perfect for our Lake Tahoe setting, so I studied the technique, closed the books and went on my way to replicating the beauty around us,” she says. However, finding fabrics to create landscape quilts is difficult—Colbert says those fabrics are different than those used in 98 percent of traditional quilts. She browses online and works with a fabric rep to find her unique fabrics. Carla Beebe of Truckee says she’s been a patron of Colbert’s for more than 25 years, and especially appreciates her landscape pieces. Colbert defines the look she wants to capture—perhaps Lake Tahoe, or maybe a stream and a field of flowers in front of snow-capped mountains and sky. Once she decides on the design, she lays out her pieces, square by square. “I usually work my pieces from the bottom up to get the right perspective,” Colbert says. Once the image is set, she pins a number to each row and picks up the square in stacks with the numbers separating each row. She sews the squares into rows, then the rows into a squares or rectangles. Colbert adds borders, then topstitches the quilt with a binding strip to complete the design. While Colbert’s Lake Tahoe landscape quilts use as few as six or seven different types of fabric, her abstract quilts are comprised of many more—some with over 100 different fabrics. As an artist, Colbert says she finds inspiration everywhere—in magazines, buildings, clothing (men’s shirts in particular, she says, have the most amazing patterns). Her attitude toward design, and the way she meshes fabrics that wouldn’t normally be used together, gives her pieces a vibrancy and visual movement. 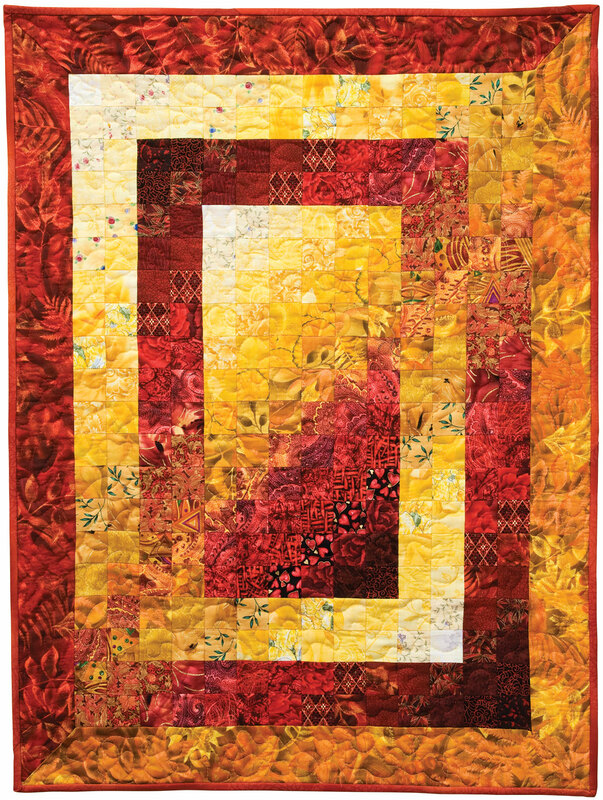 Though her quilts span the spectrum of colors—to include a piece made of various paisley fabrics—Colbert often leans toward fall colors, drawn by the golds, reds, greens and browns that reflect the season’s changing leaves. Her personal favorite is a quilt named Fire. 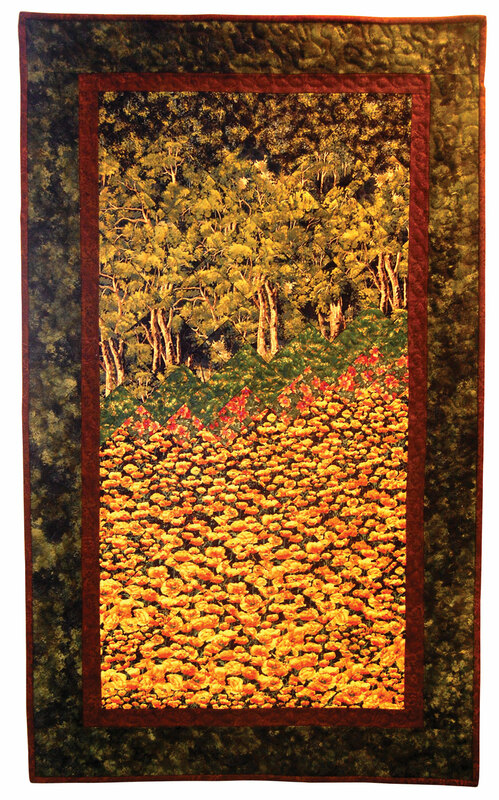 Both her abstract, color-based quilts and her landscape quilts are popular among her customers, Colbert says, noting that she sells about an equal number of both. When Colbert first made the transition to self-employment, she sold her quilts at local art shows. 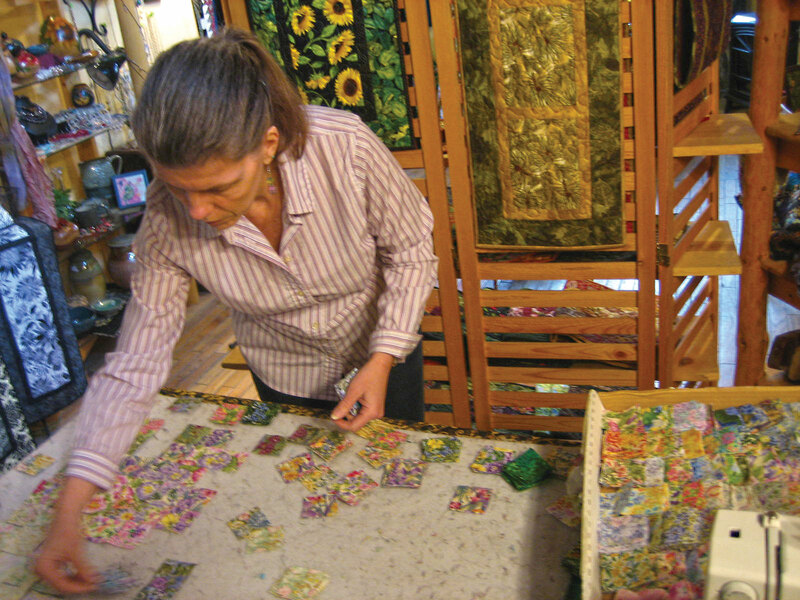 Emboldened by her success, in 2006 she opened the shop Handmade At The Lake, which sells both her quilts and her home line of quilted products—such as table pieces—as well as works by other area artists. “I wanted to be able to offer other local goods to people,” she says. “After all, not everyone is in love with my work. Besides her brick-and-mortar storefront, Colbert runs online shops on Etsy and on Amazon’s handmade section. “I love having my work in front of millions of eyes around the world,” she says. Alison Lee, who teaches art at Incline’s Lake Tahoe School, first met Colbert more than a decade ago at Tahoe City’s North Tahoe Arts. Lee has displayed her hand-printed cards, prints and fabric arts at Handmade At The Lake for the past three or four years. Most days, Colbert can be found at Homemade At The Lake, which also functions as her studio during the week. Colbert works on multiple quilts at a time, often sewing them together while she watches a movie or football game. But quilting is only one of Colbert’s many interests. She also enjoys singing (so much so that she’d hoped to be a vocalist when she was young) and sings with both the Sierra Nevada College choir and the St. Patrick’s Episcopal Church choir. She’s served on the board of multiple nonprofits and enjoys exercising, reading, traveling and being with her family. Colbert says that, had someone told her when she was in her 20s that she would eventually become an artist, she never would have believed it. But today, with 17 years in the business, Colbert is grateful to be doing what she loves. 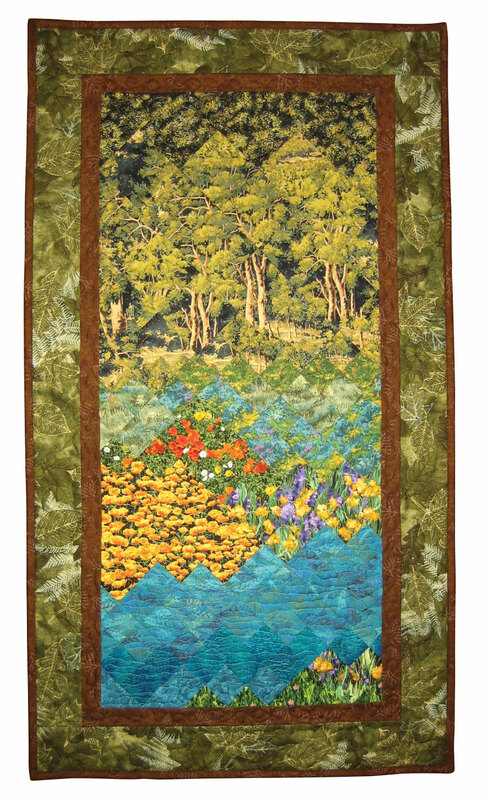 Karen Colbert’s quilt designs are available at Handmade At The Lake, 873 Tahoe Blvd., Ste. 3, Incline Village, (775) 833-0637 or www.handmadeatthelake.com. Her work can also be found on Etsy or Amazon. Reno-based writer Alison Bender‘s biggest sewing accomplishment is a scarf she made for her daughter, which took her much longer than she likes to admit.